Elekit TU-8340VK Amplifier Follow-up: French Impressionism, Triode Existentialism and Swedish Idealism? A big thank you to my buddy Ed for graciously volunteering to bring these speakers over to my listening room. Ed, you are a gentleman, I don’t care what people say. The Triangles are normally driven, chez Ed, with DIY 300B SET monoblocks and a transformer-based passive attenuator or highly modded active line stage. At first glance the Triangles seem like a sort of scaled-down version of my PSB’s. A 1” metal dome tweeter, a 4” midrange, two 5½” woofers and a port grace the front baffle of these slender floor standing speakers. Their rated impedance is 6 ohms and sensitivity 91db/w/m. They are, in theory, an easier load and require significantly less power for equal loudness than my PSB’s need. You don’t move the 111 pound (50 kg) PSB’s around, so much as assault them until they’re out of the way and intimidated into a corner. It would have been better to remove them from the room, but I didn’t feel the need for a back injury. I put a shorting wire across the terminals to lessen their impact on the sound of the other speakers in the room. I set up the Triangles in approximately the same positions just vacated by the PSB’s. (The Elekit was in ultralinear mode using E-H 6550 tubes.) Then the same track I’d just played on the PSB’s was repeated. To approximate the same loudness I had to turn the volume control down a couple of notches. The Triangles don’t have the bass extension that my PSB’s have, two 5½”woofers versus three 8” woofers, but they carry the bass line along in a spritely manner. It was apparent that the TU-8340VK was having an easier time coping with and controlling the Triangle’s woofers, compared to my PSB’s. The midrange was clear but maybe just a dB or so too high in level compared to the bass, for my tastes. In regards to the high frequencies, I can understand the criticism leveled against Triangles of the early to mid 2000’s. They are overly bright – which is OK with perfect recordings but with the standard fare we get, the highs can fatigue a listener quickly. I think if the Triangles had been on the receiving end of a bit of French polish, courtesy of someone like Canadian Paul Barton (of PSB fame), they might have found more fans in North America. I switched the Elekit over to the Genalex KT77 tubes that are my favourite from the power tube shootout. The KT77’s tamed the highs a bit, and had a bit warmer midrange as well. To my ears this tube/amp/speaker combo gets a lot of things right. But if the Triangles were my speakers I’d still put a couple of resistors between the crossovers and the tweeters to reduce their output by a dB or two. A more subtle alternative would be to change the coupling caps in the TU-8340 to ones with a bit smoother perspective. Now I wouldn’t recommend this for every amp, but as the TU-8340 is a kit and if you’ve built it yourself, it’s not too onerous a chore. There a few observations on capacitors later in this report. Switching over to triode, literally flicking a switch on the back of the TU-8340VK, changed the game noticeably. One thing you need to be aware of is the amp has slightly more gain in ultralinear mode than it does in triode. I measured the voltage difference with a 1000Hz tone, and according to my brainy, rocket scientist buddy Dr. Brown, triode mode is about 1.4 dB lower than ultralinear. All things being equal, the louder will usually sound better. The volume difference was slight, much less than one step on the attenuator in my line stage, or a very small amount of rotation on the volume pot in the TU-8340VK. The sonic differences noted below were more detectable than the difference in volume. We all know the cliché about single ended triode (SET) amps: great midrange but rolled off in the bass and treble. Well, that sort of sums up the TU-8340VK in triode mode – though, perhaps because it’s a push-pull amp, the differences between the two modes aren’t quite so stark. Triode was definitely an advantage with the Triangles; the treble was tamed to a level that made music much more enjoyable. When first throwing the switch to triode, the bass had a little less drive and bounce, but after a few minutes of listening it wasn’t missed all that much. Refer to part 2 of the main TU-8340VK review for details of tracks used for auditioning. Piano on the Miles Davis and Mark Knopfler discs seemed smoother, yet felt closer, more intimate in triode mode. Bass had less drive on both discs. I found with the Davis disc I was less inclined to tap my toe. If this was my full-time amplifier, with the stock output transformers I think I’d be inclined to use ultralinear more than triode, but it’s nice to have the option. In a nutshell, triode is more seductive, ultralinear more instructive; triode more expressive, ultralinear more impressive. You get the picture. The ultralinear/triode switch is the audiophile equivalent of having your cake and eating it too, almost. But be warned, human nature being what it is, TU-8340VK owners will probably think to themselves, “I’d like to have the best of both.” I know I did. I finally finished the metal work on my entry-level Aikido line stage, and thought I’d show you faithful – I almost typed fateful – WoS followers a picture. Another linestage is not really needed in the Graham household. I built this one so I would have a decent bargain reference when reviewing amplifiers with non-balanced (RCA) inputs. I do it all for you fateful WoS fans. The fact that I had fun machining, assembling, tuning and listening to this line stage had nothing at all to do with my desire to build it. I’ve rolled tubes, I’ve rolled digital interconnects. I never thought I’d roll transformers. Victor Kung spent a not inconsiderable sum of money in development costs for custom transformers. These are bespoke parts made solely for the TU-8340VK, and only available through Victor (VKMusic.ca). Lundahls are different. Probably 95% of the transformers in tube amps are conventional EI core types; not Lundahls. Most transformers have insulated leads exiting a cover; not Lundahls. The stock transformers just plug in; not the Lundahls. To prep the Lundahls for installation you must first screw the supplied spacers into the base. The secondary-side connector board will only go on one way. The primary-side connector board must have the script, “Primary of LL2769,” right side up when the transformer is resting on the previously assembled spacers. Next solder the connector cables to the boards such that the cables ‘exit’ over the bottom edges. I’d advise assembling the secondary boards to the transformers first. But before you do, there might be a bit of shellac on the wires which should be removed with solvent or melted away with a soldering iron. It’s best to cushion the primary side (short pins) with some foam or corrugated cardboard, placing it down on a work bench and then assembling the secondary board. Slide the secondary board over the wires, leaving about a 1 to 2mm gap between the board on the transformer and the connector board. Solder the wires and trim the excess. Gently rest the transformers on their secondary boards. Assemble the primary boards, oriented as described above, to the transformers, leaving a small gap if you wish. Solder and trim the excess pin length. I went a little off-plan because I expected to have the transformers in and out a few times. See pictures below. I drilled 3mm holes in non-conducting areas of the connector boards so that I could tie the wires down for strain relief. Heat shrink tubing was added to the primary wires to reduce the possibility of chaffing when passed through slots in the chassis. I also put strips of double sided foam tape, ~1mm thick, between the board on the primary side of the transformer and the connector board, to reduce strain on the pins. I’ve been procrastinating writing this next bit. What bothers me about the Lundahls concerns safety. High voltage on the primary side is exposed, and too easily touched. Assemble the transformers to the sub chassis so that the primary sides are close to the power transformer and DO NOT operate the amplifier without the overall chassis cover in place. Whether by design or by accident, the Lundahls shipped to me came with two thin pieces of clear plastic just a bit larger than the connector boards. I secured these to the primary sides with more strips of double sided foam tape. See picture below. Pass the transformer wires through the slots in the transformer sub-chassis. Place two flat washers over each screw that originally secured the stock transformers. Assemble the screw and washer combos to secure the transformers. The remainder or the assembly is as if using stock transformers. I didn’t think I’d get to listen to the amp with the Lundahls. 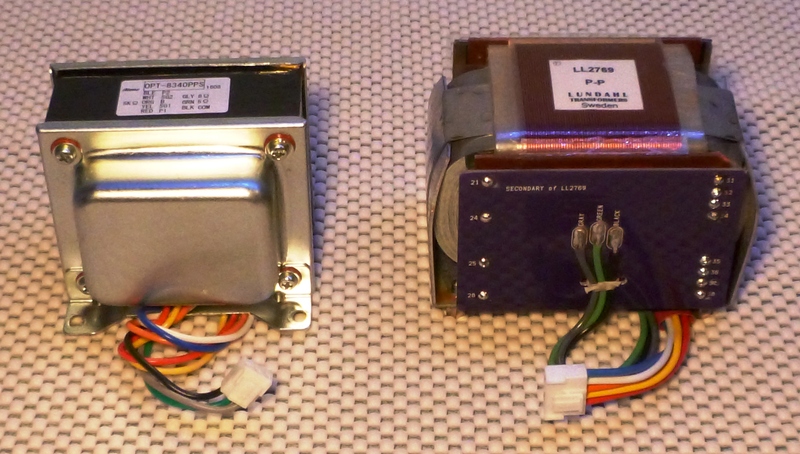 Victor Kung kindly offered these after both parts of the TU-8340VK review had been submitted for publication. At this point I’d settled on the Genalex reissue KT77 tubes for output duty. Does a piece of wire need to be broken in? Do a couple of lengths of wire wrapped around a piece of ferrous material need to be broken in? I’d have bet money that they didn’t need break-in, and I’d have lost. After about 15 hours of running I’d wondered what had happened to the sweet sounding amplifier my memory had me expecting. Bass was deep but not well controlled. Mids were on the opaque side and highs seemed spitty and uneven. Oh dear, I thought. One thing I found out very early on in my as yet short career as a reviewer, is that no fun is to be had writing a negative review. I don’t enjoy trashing something and if I must, I try to do it as gently as possible. Unless of course, a bad sounding piece of equipment has been foisted on the public for a crass commercial reason. Then, if I’m not happy, I’m certainly willing to call a spade a spade. I gave the amp another 24 hours of running time. What a difference a day makes. The sweet amplifier was back and better than before. I put about another sixty hours on the amp before doing any serious listening. Earlier in this report I had bemoaned the compromise when switching from ultralinear to triode with the stock transformer. With the Lundahls installed it’s a much smaller compromise. Triode mode gives up a little bit of bass clarity and control, but virtually no pace or rhythm is lost. Gains in vocal expressiveness, both male and female, are noticeable and not at the expense of increased sibilance. Everything in triode is slightly smoother too, but not at the expense of detail. Pianos especially sound more present and real. Saxes are saxier, trumpets are brassier. Voices sound more human. The Lundahls in triode mode with the Genalex reissue KT77 tubes is really like having your cake and eating it too. The only serious down-side to triode mode is reduced power. Whether this reduction is critical or not will be determined by the sound pressure level required, coupled with the efficiency of a particular set of speakers, combined with the room they will be used in. The Triangles with the amp in triode mode played very nicely in my room and I’m not shy about cranking it up. The sound in triode mode driving my PSB’s was very seductive as long as I didn’t try to push them too loud. I’m guessing that the KT77 tubes in triode mode are only really capable of about 15, 20 at the outside, clean watts per channel, but oh.. what lovely watts they are. Triode mode driving the PSB’s falls a bit short of the power needed to drive them at the volume I sometimes like. On the same day the above Lundahl assessment was performed, I switched back to the stock transformers. The question I’m sure you want answered is: “Are the Lundahls worth another $500 US on top of the price of the amplifier?” The answer is: Absolutely yes, if you have 500 US dollars, ~$675 CDN. As good as the TU-8340VK is with the stock transformers, the amp with the Lundahls just blows the stock transformer equipped version out of the water. The stock transformers aren’t bad, but compared to the Lundahls they have less of everything – and the difference isn’t subtle. Less bass, less bass articulation and depth, less specific imaging, less treble “sweetness”, less midrange “magic”, less detail in general. If you want the most out of this amp, the Lundahl upgrade is mandatory. It doesn’t give me any pleasure to tell you more money has to be spent to realize the true potential of the TU-8340VK, but there’s no way to sugar coat it. Now that I’ve heard the Lundahls in this amp, I can’t listen to it with the stock transformers. To recap, the amp that wowed me has the following: resistor upgrade, the less expensive Mundorf capacitor upgrade, Lundahl upgrade, Tungsol reissue 12AT7W and Genalex reissue KT77 tubes. The sound of this amp with the Lundahls in triode mode gets awfully close to that of my Audio Research separates. The ARC’s are more powerful, image better, have another layer of resolution, plus there is an ease to their overall presentation that more easily seduces me in to music. I think it’s time for me to stop tweaking the Elekit: my ARC gear is getting jealous. I want to say a bit more about the Elekit amp outside of the formal review. First off, it’s a great sounding amp and in my view, more than fairly priced. The options available from vkmusic.ca are fairly priced too. The case work is not what you would expect from some of the very high end audio brands, but it is accurately made and well finished out of stamped and folded steel. There are no sharp edges to chafe wires or cut fingers. The electronic parts are good quality, name brand pieces. A note on the screws: When I first opened the kit, I noticed their description in the parts list as self tapping. I thought uh-oh, sheet metal screws that will likely leave some metal shavings, not good. I needn’t have worried. The screws would more accurately be described as thread forming. The thread on the screws is triangular in cross section and just displaces metal on the chassis to form a thread in a pre-drilled pilot hole. The only debris generated were a few small flakes of paint removed from the pilot holes. 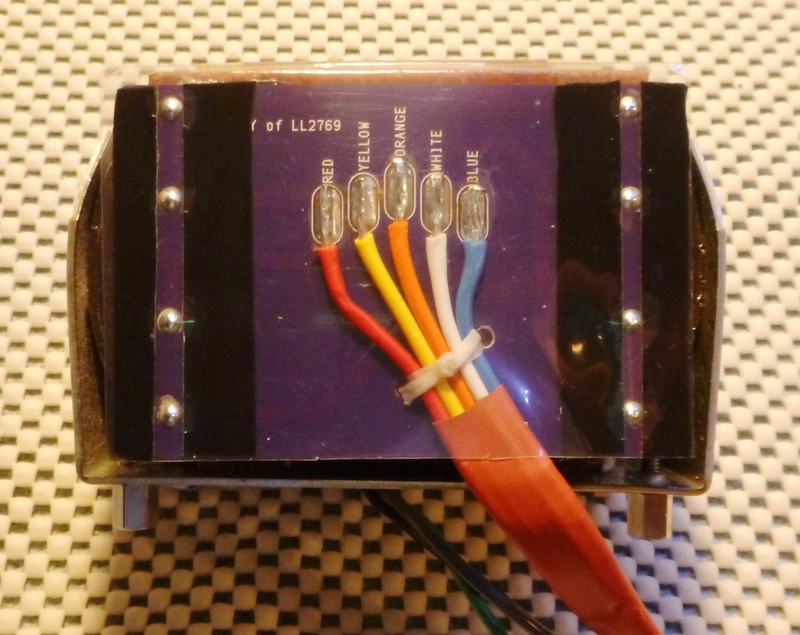 Elekit has cleverly engineered the kit so only two screw sizes are required. 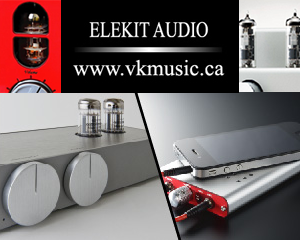 It’s nearly impossible to choose the wrong one for any given location on the amp; kudos to Elekit. With regards to the capacitor swap, I purposely left the leads on the eight stock caps a bit long to enable easier removal. A little heat from the soldering iron and out they popped. Elekit leaves lots of space on the PCB, and multiple holes so caps of various sizes can be easily accommodated. I put short pieces of double-sided foam tape on the board to help anchor the Mundorfs securely. A bit of soldering, a reversal of the dis-assembly process and the amp was ready to go again. All in all, the cap swap took about an hour and a half. If you have a different fave cap it might be possible to use them instead. It should meet the same electrical specs as the base cap, and be no longer than 57mm and not exceed 31mm in diameter. The amp manual details the electrical spec and size limitations. If you are thinking of purchasing a TU-8340VK, it might be advisable to hold off on a capacitor upgrade. First settle on tubes, then consider a capacitor upgrade as a way of fine tuning the sound that last little bit. The power tube shootout I did using this amp (and one other) might help potential buyers narrow their choice (link above). Mundorf caps, generally speaking, can be a bit bright in the high treble. If a brighter sound is desired, I’d go for the Mundorf Supreme EVO as offered by Victor. For a smoother sound, maybe something like an Obbligato Gold cap could do the trick. Between the two, perhaps a Mundorf Supreme, the standard version, would satisfy. This link is one resource that might help with cap selection. For a reviewer, the output terminals are a bit of a pain, not easily gripped when using spade terminations. Just don’t be tempted to put a pair of Vicegrips on them, damage may result. The output terminals are better suited to banana plugs or tips rather than spades. The volume pot is a bit light-weight but there are holes on the small PCB it mounts to for a full size Alps Blue Velvet pot – about $25 from the usual suspects – and that would be a decent upgrade. The mechanical mounting of the pot board would be a bit different with a Blue Velvet installed, but easily accommodated. I’ve seen a picture online where someone has already performed this mod on their TU-8340VK. If I were buying this amp for myself I’d stick with the stock volume pot until I figured out where the optimum position would be for my line stage. Then I’d measure the resistance of the pot in my favoured position and buy four precision, high quality resistors. Next I’d disconnect the pot, but leave it and its knob in place for cosmetic reasons. Finally I’d solder in the precision resistors. Volume pots (and input select switches too) are weak points in the signal chain, and having one in an amp and another in a line stage is one pot too many in my estimation. I’m not an electronics engineer, but it’s fairly apparent from the circuit diagram how the semi-automatic bias adjustment system works. It “reads” the voltage across a small value resistor connected to each output tube. It then adjusts the bias voltage on the grid of each output tube to set the same voltage across all four resistors to an aim point. This ensures identical current flow through all four tubes. Equal current flow in both halves of a push-pull transformer is highly desirable as it minimizes distortion. I’m not giving away any secrets. This is how the bias is set, albeit manually with a screw driver and a multimeter, on my ARC Ref 110, my Parks Audio Eiclones and many other amplifiers as well. Elekit is to be commended on their slick application of what is the most desirable bias method (fixed), see explanation of fixed bias in part 1 of the amp review. To save you some clicking and searching, I’ll repeat what I wrote about the TU-8340VK in the recently posted power tube shootout. …..there is something we need to consider about the Semi Auto Bias Module in the Elekit TU-8340VK. The module doesn’t “know” is if it’s adjusting the bias on a 6L6, 6550, KT150 or any other tube. Therefore the module’s bias set point must be configured such that the dissipation limit of the lowest-power tube that’s likely to be installed, will not be exceeded. This will be the 6L6GC, EL34 or KT77 depending on the plate voltage a particular amp is running. Low and medium power dissipation tubes are likely to be run in the more linear part of their range whereas the higher powered tubes (KT120s and especially KT150s) might not be quite getting the “juice” they need to sound their best. I tested this conjecture in the tube shootout, and to my ears this was generally true. Other than the “my dog is bigger than your dog” bragging rights that you get with a set of KT150’s, a decent set of more modest tubes can and for the most part did yield better sound for way less than the cost of the “big dogs”. Think of it this way; what you save buying a set of KT77s compared to buying KT150’s will get you 40% of the way to a pair of Lundahls. Even if you can afford to spend more on a power amp, even quite a bit more, the Elekit TU-8340VK, with sympathetic system, speaker and room, is a viable contender. The customization possibilities offered with different resistors, capacitors, tubes and transformers are just icing on the cake. I’ve been trying to find a legitimate reason to keep this amplifier. Most likely in a few days FedEx will come and pick it up. I think I’ll feel a bit sad, the same way I did a year ago when the new owner rode away on my Triumph Street Triple. Big thanks again to Victor Kung at vkmusic.ca for the loan of the amp. Without his kind support we here at WoS would have much less to write about. Please feel free to sign up for automatic email updates on existing articles and/or notification of new articles when they appear. While you’re at it leave a comment or ask a question if you wish. Your question will be answered to the best of our abilities. We enjoy hearing from our readers. Very nice review, shame you did not have a more efficient pair of speakers (Tannoy, Avant-garde, Spectral) it may just have made the difference in questioning cost to performance ratio with Audio Research/Triangle. Thanks for your comment Monte. At 91.5 dB/w/m the Triangles are reasonably efficient. The rated 6 ohm impedance isn’t too abusive for a tube amp. I drove them from the 4 ohm tap. They played cleanly and loud enough with the TU-8340 in triode using KT77s. Some fine day I’ll get around to building new cabinets for my Altec Flamencos. Now you’re talking efficient, ~100 dB/w/m with a 16 ohm impedance. Unfortunately the Altec cabinets have been banned from the house because they smell of mildew and old cigars (the drivers are safe inside). You can read about my Altec odyssey in MAL parts 2, 3 & 4 on this site if you wish. Thank you for this review! Just finished building the amplifier myself. Very pleased with the result and found your instructions on the optional Lundahl transformers usefull. Question, could you tell me which of the 12at7 positions are the phase-inverter and the driver? Is v1 the driver? Or simply put, are the front tubes the drivers or the phase inverters? I ask because i currently only have pairs of 12at7’s and no quad’s. In your review you do not seem to be to botherd with the 12at7 tubes sound wise… Am i correct? Thank you for the positive feedback 🙂 The circuit, appears to me, to be different than typical push-pull amps. Most have a gain stage followed by the phase splitter, which also drives the power tubes. The TU-8340, I think, does it the opposite way. It looks to me that phase is first split by the V101 and V201 (L & R channels respectively), then gain and power tube drive is provided by the second tube (V102 and V202). This is not a criticism. The result speaks for itself; this is a good sounding amplifier. You are correct that I used the same tubes in all positions; Tung-Sol reissue 12AT7W/6201. As luck would have it the Tung-Sol turned out to be a good sounding tube at a fairly reasonable price. Please see my 12AT7 mini-shootout also on Wall of Sound. The TU-8340 was used as the “test bed” for the comparison of the three different 12AT7s. I’m sorry I can’t be more specific about which tube location has more influence on the sound. My suggestion is that once your amp has broken in a bit, say at least 100 hours of running time, swap tube positions and listen again. Please see my power tube shootout on WoS. The TU-8340 and another amp were employed on this occasion. Between the two shoot-outs and perhaps a coupling cap upgrade (if you haven’t done this already) you should be able to tune the amp to sound its best for you.